Sébastien Loeb Racing : Ending up on a good note with wins and podiums ! 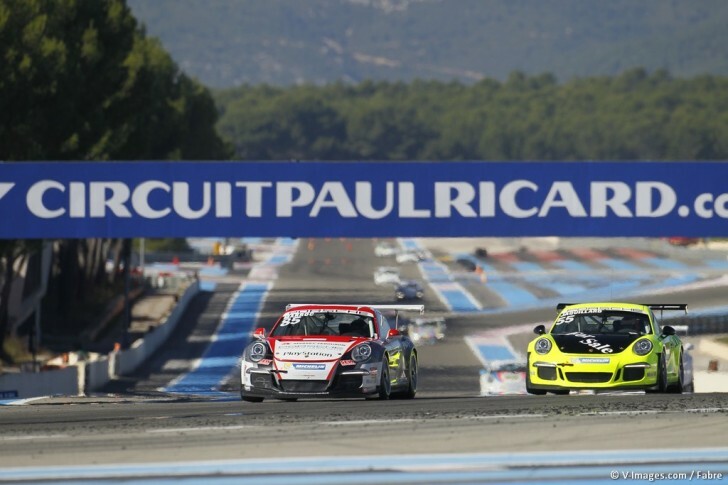 In order to maximise the Sébastien Loeb Racing’s and @LoebRacing’s chances to clinch all the titles this weekend in the Porsche Carrera Cup France’s final at the Paul Ricard Circuit, the team’s six drivers had no other choice but to attack. That is exactly what they did throughout the three days, achieving three wins in total and some podiums. 26 points behind when arriving in Le Var, Maxime Jousse gave his very best up until the end but unfortunately missed the highest step of the podium by a hair’s breadth. This honorary vice-champion title, together with Roar Lindland’s in the B class, are the final notes of the season for the team co-founded by Sébastien Loeb and Dominique Heintz. A consistent, reliable and efficient driver since Le Mans, Jousse did not seem to be bothered by any pressure at the start of the first round which he was about to lead from beginning to end. Having achieved his third 2014 success the day before, he then secured a new podium which was also monopolised by Christophe Lapierre and Roar Lindland as part of the B rankings. Though not competing for the title any more, since Nogaro, Lapierre really wanted to shine in this event which was almost taking place at home for him. He was definitely there, right on target, during both the qualifying and the race. As for the latter, Norwegian driver Lindland, his very promising first season in France ended up with two podiums, confirming his progress. Roar Lindland, 2nd and 3rd in the B class, Porsche 911 GT3 Cup No. 11 (Sébastien Loeb Racing) : « This weekend was fantastic and I cannot be but happy about it. We performed well in the practice sessions on Friday and we reached the 2nd and 3rd places of the podium right after. I am very pleased about it. The race was more tactical on Sunday, because I wanted to maintain that 2nd place in the rankings. I could have lead the race, but a contact occurred just in front of me and I had to brake in order to avoid it. Sébastien Loeb Racing leading driver Maxime Jousse was on the third row of the starting grid while his teammates occupied the 5th (Nicolas Marroc), 7th (Sacha Bottemanne and Christophe Lapierre, pole position in the B class) and 8th (Roar Lindland and Joffrey de Narda) positions. From the moment the starting lights went off, with no other choice but to impose himself in order to fight for the title, Jousse was agressive overtaking Jimmy Autunes and Tom Dillmann. He reached the third place. Marroc did the same and progressed forward two places in the first laps, actually overtaking current Champion Gaël Castelli. But the most impressive progression was de Narda’s who entered the Top 10 after seven laps. Racing at the front, Maxime takes advantage of his rival’s penalty, together with Nicolas Armindo’s manoeuvre, to reach the first place. From that point on, despite Dillmann constantly attacking, the driver from Le Var never curbed the pressure. He will cross the finish-line first, 99 thousandth of a second ahead, thus gathering some precious points in his quest for the title. The Sébastien Loeb Racing and @Loeb Racing’s armada of five drivers finished the race as a group. Bottemanne, Marroc, de Narda, Lapierre and Lindland crossed the finish line in that order in the 8th to 12th positions. Christophe Lapierre won the race in the B class just in front of teammate Roar Lindland. Once again Maxime Jousse started from the 5th row on the starting grid. Nicolas Marroc also started from within the Top 10. He was two places in front of Sacha Bottemanne, while Christophe Lapierre, B-class poleman for the second time of the meeting, was on the following row. Joffrey de Narda started from the 8th place and Roar Lindland from the 9th. Just like the day before, Jousse had to attack. He did so and placed himself just off the podium during the first lap, following his rival for the title. Joffrey de Narda took advantage of Marroc’s difficult start and got in the 8th position. Maxime’s hoped for the title as Ledogar, awarded a Drive-Through penalty, went into the pits at the beginning of the third lap. Third in the rankings, Maxime was potentially champion. Fighting with Lonni Martins, de Narda held onto the 7th place while Bottemanne was 10th, Christophe Lapierre 12th and leader of the B class rankings within which Lindland occupied the 3rd row. Positions would not change much later on, Maxime climbed on the third step of the podium. Unfortunately, due to his rival’s ranking, he missed the title of champion by a couple of points only. De Narda wrapped up his brilliant performance with a sixth-place finish, two rows in front of Lapierre, B-class undeniable winner. Lindland completed the leading trio of the category and Nicolas Marroc finished at the 13th place.